China Daily: Increase and diversify corporate membership for China Daily's CEO Roundtable. 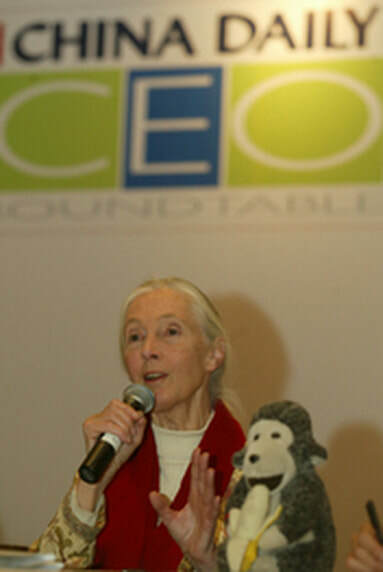 Jane Goodall Institute: Build strategic partnerships; give companies concrete action steps to inform their practices. Use cross-sector dialogue to deepen and establish partnerships between JGI and Chinese/International companies. China Daily reported on a diverse range of environmental issues needing to be addressed and highlighted business efforts to advance these efforts; 3 corporations expanded brand recognition by supporting JGI initiatives; 1 joined the governing board; and 1 executed corporate wide disposal system for recycled materials. inclusive, diverse, highly qualified labor force. Transform cultural and professional ecosystem; increase opportunities and skills sets of the female workforce. Innovate investment, employment and leadership system. Build a pipeline - 7th grade to senior level - to increase availability of global female and minority talent, particularly in STEM careers, male dominated industries, and leadership positions; increase and scale VC and angel investments to female and minority founded companies; increase the number, scope, scale of female and minority investors; establish internal strategies, policies, and measurable best practices and incentives. It is my honor to serve as the Leadership Forum Chairwoman and highlight the significant role today's business leaders can play. It is our collective effort that will empower today's children and the communities within which they live. Meet government priorities, consumer demand, and corporate willingness to cultivate positive societal norms, perceptions, and behaviors that lead to socio-economic progress. Identify activities to be carried out individually and through strategic partnerships. Innovative, profitable, and impactful practices among brands. New partnerships between government officials and creative industries. Development of FLB's three product lines that tackle key priority areas: Employment & Women; Entertainment & Society; Labor & Human Trafficking.